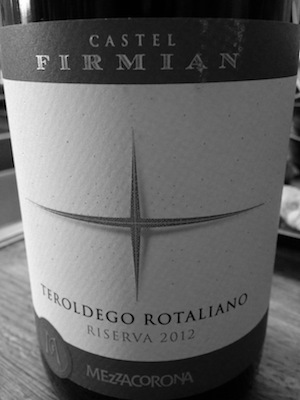 Rich juicy Ribeana like fruit with depth and concentration… Great value Italian table wine. Trentino in north-eastern Italy is an area mostly renowned for unleashing ‘Pinot Grigio’ on an unsuspecting world. However, it’s also the heartland for the ‘Teroldego’ grape variety, which makes dangerously moreish fruity wines. In the glass this has a deep ruby with purple rim, black cherry (Morello), Blackcurrant and purple flower (Violets) aroma. On the palate there’s sweet ripe concentrated blackcurrant & black cherry fruit with soft vanilla on the palate. High mouth watering acidity and a long juicy finish full of ripe black fruit and well judged use of oak that’s balanced and integrated… just enough to lend texture and structure but without impacting the flavor beyond enhancing the vanilla. If you’ve never tried a ‘Teroldego’ wine before, I urge you to give this a go. That said, they are few and far between and I’ve yet to see one on most shelves. Fortunately, The Wine Society has this for sale for £7.50 a bottle full price.